The hot questions for the Australian Bureau of Meteorology (BOM) mount up. Rutherglen was one of the temperature recording stations that was subject to large somewhat mysterious adjustments which turned a slight cooling trend into a strongly warming one. Yet the official notes showed that the site did not move and was a continuous record. On paper, Rutherglen appeared to be ideal — a rare long rural temperature record where measurements had come from the same place since 1913. The original cooling trend of – 0.35C was transformed into a +1.73C warming after “homogenisation” by the BOM. To justify that the BOM claims that there may have been an unrecorded shift, and it was “consistent” with the old station starting further up the slope before it moved down to the hollow. Today retired scientist Bill Johnston got in touch with Jennifer Marohasy, with me and with Graham Lloyd of The Australian to say that he worked at times at Rutherglen and the official thermometer had not moved. It was always placed where it is now at the bottom of the hollow. That information has already made it into print in The Australian. The original thermometer records suggest a slight cooling trend. The adjusted ones (red) are very different. 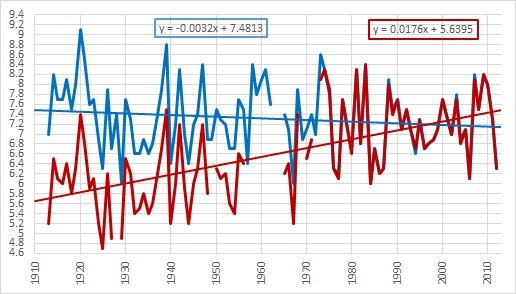 Rutherglen: the major adjustments in minimum temperature data are in 1966 and 1974. Both were detected through comparisons with neighbours. The nature of the change is consistent with the site moving from a location near the main experimental farm buildings (which are on a small hill) to its current location on low-lying flat ground (minimum temperatures are normally higher on slopes than on flat ground or in valley bottoms). Graham Lloyd points out the official catalogue of the national temperature network claims that Rutherglen is 7km southeast of the town and was established in 1913 and “There have been no documented site moves during the site’s history”. If our “best” thermometer data needs massive adjustments 70 years after temperatures are recorded the accuracy of the whole network comes into question (as I said yesterday). The BOM don’t mention how unreliable thermometers are when they tell us how many new extreme records we seem to be setting. It’s not just one station. The adjustments over the whole network are not “neutral” as claimed. Ken Stewart showed they raise the raw trends on minima by as much as 50%. Bill Johnston contacted a former colleague today who confirmed the site has been there since “year-dot”. Hopefully we will get some photos soon. Bill has a lot more to say, and I’ll be adding to this with more information or another post soon.